Support Staff duties include washing dishes, serving food, and cleaning and maintaining facilities. Senior Support Staff also help to facilitate recreational activities such as field games and archery. Lifeguards are on duty during the afternoons and work on other support jobs during the rest of the day. 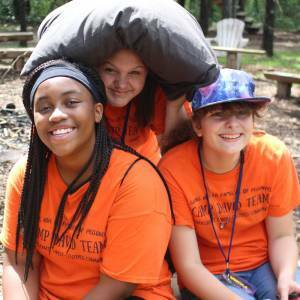 Support Staff have their own chapel time and evening activities to help them grow in Christ and develop camp community. Many of the other volunteers such as photographers, office help, and green team leaders all join in on the evening activities. Support staff have an average of two hours of free time per day. Support Staff have the opportunity to grow in many skills from drama, puppetry, construction, leading worship, food service, gardening, and caring for farm animals. Be sure to mark on your application if you have a particular interest in any of these areas. Responsible For: Completing with excellence all the chores that need to be done to help keep the camp program running smoothly. Responsibilities: Uphold the CDO mission statement through your actions and words while serving at camp. Spend time alone with the Lord everyday; be in the Word! Use the Summer Devotional Journal. Do your chores cheerfully, thoroughly, and go the extra mile. Report to Support Staff Leader when you finish your responsibilities. Let the Support Staff Leader know of any concerns– plants dying, out of cleaners, need more trash bags -as soon as possible! Have a servant’s heart and be willing to help with other things that come up during the camp program. Be flexible and ready to trade places with someone. Please understand that if you are asked to do a different job than normal, your leaders have the big picture of what needs accomplished to keep camp excellent. Remember that your enthusiasm– whether you are singing camp songs or serving food, that can be the thing that changes a camper’s day-or week!